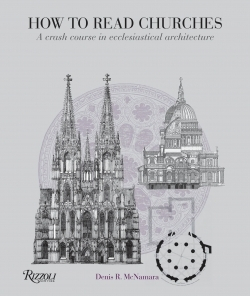 How to Read Churches is a pocket-sized guide for neophytes that’s convenient enough to tote while touring featured buildings ranging from Boston’s Old North Church to Vienna’s St. Stephens Cathedral. In it, Dr. Denis McNamara discusses the structure and purpose of ecclesiastical buildings, enlightening readers about details such as gargoyles: the sad, stone figures on church facades and along the edges of roofs, that are meant to be read as grotesque figures representing those outside the kingdom of heaven; they can also serve as drain spouts for the building, reducing the erosion of mortar. Author of Heavenly City: The Architectural Traditions of Catholic Chicago, McNamara also reveals the meaning of styles and symbols ensconced in stone, wood, metal, and glass. The book’s 575 color illustrations are from period engravings and line drawings. Among the more than one hundred churches, abbeys, monasteries, and chapels mentioned are Lichfield, the only medieval cathedral in England with three full spires; the Basilica of Sant’ Apollinare Nuovo in Ravenna, Italy, with its mosaic of moving saints symbolizing joy in heaven; and Westminster Abbey and its ornate bronze gates that lead to a large Lady Chapel, which honors the Virgin Mary.